The first argument --types-array=UA_TYPES defines the name of the global array in open62541 which contains the corresponding types used within the nodeset in NodeSet2.xml. If you do not define your own datatypes, you can always use the UA_TYPES value. More on that later in this tutorial. The next argument --existing ../../deps/ua-nodeset/Schema/Opc.Ua.NodeSet2.xml points to the XML definition of the standard-defined namespace 0 (NS0). Namespace 0 is assumed to be loaded beforehand and provides definitions for data type, reference types, and so. Since we reference nodes from NS0 in our myNS.xml we need to tell the nodeset compiler that it should also load that nodeset, but not compile it into the output. Note that you may need to initialize the git submodule to get the deps/ua-nodeset folder (git submodule --init --update) or download the full NodeSet2.xml manually. The argument --xml myNS.xml points to the user-defined information model, whose nodes will be added to the abstract syntax tree. The script will then create the files myNS.c and myNS.h (indicated by the last argument myNS) containing the C code necessary to instantiate those namespaces. If you look into the files generated by the nodeset compiler, you will see that it generated a method called extern UA_StatusCode myNS(UA_Server *server);. You need to include the header and source file and then call the myNS(server) method right after creating the server instance with UA_Server_new. This will automatically add all the nodes to the server and return UA_STATUSCODE_GOOD if there weren’t any errors. Additionally you need to compile the open62541 stack with the full NS0 by setting UA_ENABLE_FULL_NS0=ON in CMake. Otherwise the stack uses a minimal subset where many nodes are not included and thus adding a custom nodeset may fail. 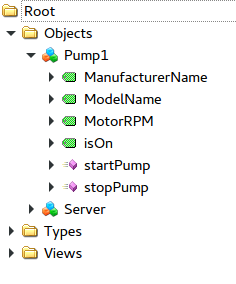 If you start the server and inspect the nodes with UA Expert, you will find the pump in the objects folder, which look like this Fig. 2. For every nodeset we are depending, we need to call the nodeset compiler, bottom-up. The first nodeset is NS0. This is automatically created by the stack if you enable UA_ENABLE_FULL_NS0=ON in CMake. So we do not need to care about that. If you look into the main CMakeLists.txt you can find the corresponding call to the nodeset compiler. It uses some additional flags which should only be used for NS0 and are not required for other nodesets. The namespace parameter indicates the namespace index of the generated node IDs for the type definitions. Currently we need to rely that the namespace is also added at this position in the final server. There is no automatic inferring yet (pull requests are warmly welcome). The CSV and BSD files contain the metadata and definition for the types. The --no-builtin argument tells the script to skip internal datatypes which are always included in the stack. The last parameter is the output file and at the same time the name of the types array: UA_TYPES_DI. This call is quite similar to the compilation of the DI nodeset. As you can see, we do not define any specific types array for the PLCopen nodeset, but just use UA_TYPES to ignore it. Since the PLCopen nodeset depends on the NS0 and DI nodeset, we need to tell the nodeset compiler that these two nodesets should be seen as already existing. Make sure that the order is the same as in your XML file, e.g., in this case the order indicated in Opc.Ua.Plc.NodeSet2.xml -> UANodeSet -> Models -> Model.